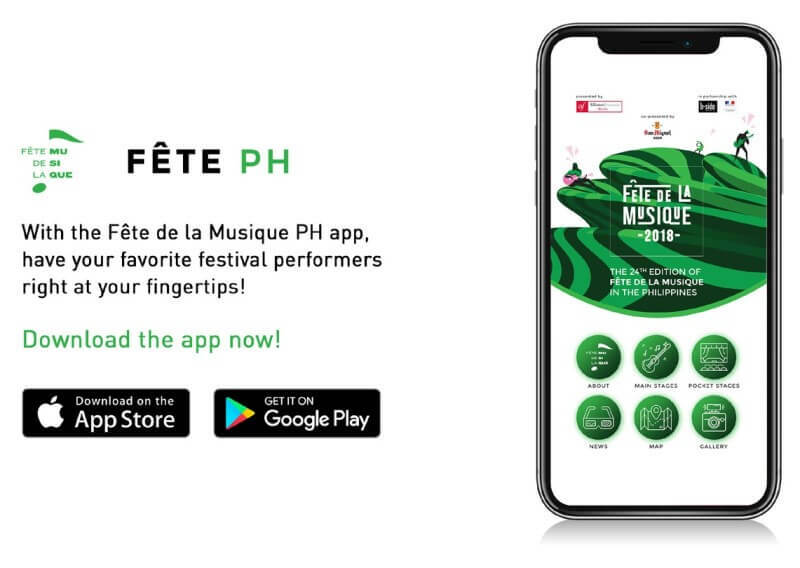 Expecting more than 30,000 Filipino Music enthusiasts to join its festival, Alliance Francaise de Manille (AFM) and B-Side Productions just launched the Fête PH app for the upcoming Fête De La Musique 2018! Eyeing to help music fans in enjoying the said festival even more, the organizers have teamed up with Bizooku to develop the Fête PH mobile app. Fête PH features all relevant information that participants need to know about the annual free-for-all music festival. Also, the app gives the schedule of performances in the main stages, as well as the schedule of events in the pocket stages. It sports tab with maps, detailed addresses, and contact numbers of all the venues for this year’s festival. The upcoming Fête De La Musique 2018 will happen on June 23, 29, and 30. Meanwhile, Fête PH is now available for download on Google Play and Apple Store.